Features and Benefits: Detachable Elevating Leg Rests. Adjustable Back Height. 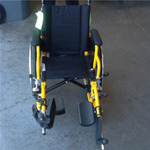 Gently used Medline MDS806140 pede "KIDZ" wheel chair Please call for details and pricing!